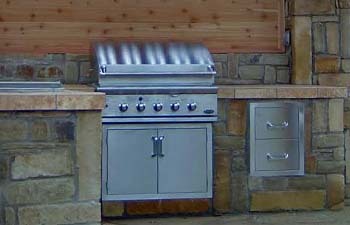 Whether you regularly entertain or just enjoy preparing an occasional meal outside, an outdoor cooking area is a great addition to your backyard. 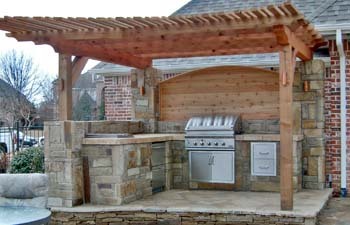 Our strategy in building outdoor kitchens can be summed up as "from the top down." 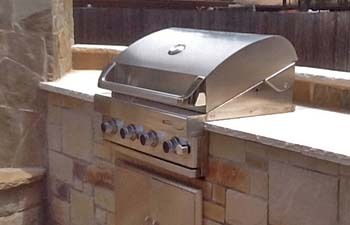 In other words, we do far more than install barbecue grills and other outdoor cooking equipment: we ask questions to learn about your needs and preferences, from your favorite colors to your cooking style, so that we can provide you with an outdoor kitchen that you’ll be proud of for years to come. 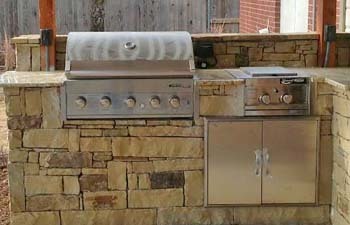 From marble countertops and stainless steel ovens to arbors and flagstone patios, we truly enjoy integrating the elements that will make your outdoor kitchen a place where it’s a joy to cook and socialize. 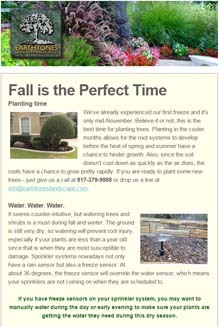 Contact us to put our designers to work for you.